RICHMOND, Va. (WRIC) -- FeedMore's annual gala to help tackle hunger in the region is returning for a 17th year. 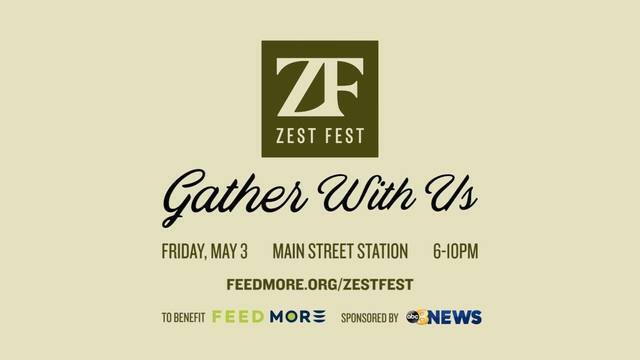 Zest Fest 2019 is happening from 6-10 p.m. on Friday, May 3, at Main Street Station in Shockoe Bottom. Last year, more than 400 people attended the event at the Greater Richmond Convention Center, raising over $150,000 towards hunger relief in Central Virginia. The event brought in enough funds to provide roughly 600,000 meals to neighbors in need. This year, Zest Fest 2019 presents guests with an opportunity to gather for a seated, coursed family-style dinner prepared by several area chefs. Individual appetizer and dessert stations will flank the evening with custom cocktails, along with Virginia beer and wine. 8News is a proud sponsor of Zest Fest 2019, and our own Juan Conde will once again be emceeing the event. We hope you join us! More to come, but in the meantime, follow this link to purchase tickets and for more information.